Having beaten lower tier side Bidco FC in their first friendly of 2015, Gor Mahia continued their preparations for the CAD Champions league with a 1-0 win over KPL side Western Stima. The goal was scored by new signing Ronald Omino who ran down the flank before cutting inside to score in a manner reminiscent of Dutch forward Arjen Robben. Incidentally, Omino was playing against his Father Henry Omino who coaches Western Stima. Coach Frank Nuttal was satisfied with the win. “I am trying to get my first XI and so far I have played different teams for each half and I am satisfied that the team is taking good shape,” coach Frank Nuttall said to goal.com. 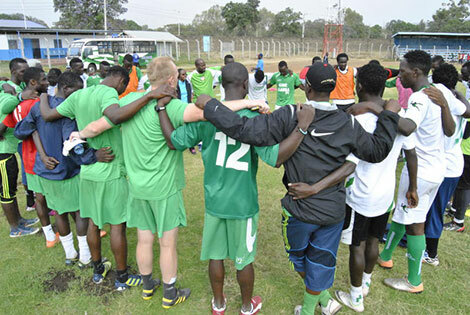 Gor Mahia will continue their preparations by travelling to Mombasa to play Bandari on Saturday. They will then play Coast Combined on Sunday. The tour of Mombasa will somewhat prepare the Kogalo for the weather in Madagascar. After Mombasa, Gor Mahia will play high profile friendlies against Power Dyanamos of Zambia, SC Villa of Uganda and Vipers of Uganda. “Uganda’s SC Villa and Vipers FC had also jointly invited us for a friendly on that same weekend, but we have requested them to push the invite to the 8th of February so that we can play Dynamos first,” said club official Ronald Ngala to the Nation. Coach Frank Nuttall is determined to make an impact at the continental level, something Gor Mahia has not done in this millenium. “In my opinion, the club has made enough impact in the local front so it would be a good thing if we could replicate the same impact outside the country. To do that, we must get out of the comfort zone and go the extra mile and playing these build-up matches is one way of doing that,” said Nuttall to the nation. Jakoyo, the coach is trying a few systems and therefore don’t expect 5-0 minimum drubbings. What I like about the Mombasa trip is that there is likelihood of the coach fielding players for more than 45 if not 90 minutes unlike what we have been seeing before. He will certainly filed two different teams on Saturday and Sunday so a number of them will get 90 minutes on the pitch for the first time during this pre-season. out of curiosity…what happened to jared obwoge who we sent out on loan to posta rangers? i wish we loaned bataro to a team where he can be the undisputed no.1.at ushuru he will have a battle in his hands to upstage samuel odhiambo and ian otieno…i wish him all the best regardless!! @Pmawego, I agree with you. It is not just about the goals. The coach usually says it is a team victory. The goals should be generated by the total team work. When this hits the road running then he can begin to be more pointed. He has also been making it clear that he is in the process of making the first eleven and this is not an easy task. Every player is putting in their best. If you can remember some guys could not make it because of speed and laziness. The competition within the Team is stiff and this is what we have been looking for. When every thing jells together then it will be a good game. I am so glad that the coach has not hidden his intentions. Gor has made an in on the local seen and now it is time to make an impact in the region. That is being visionary.Let us support in the best way possible. The good news is that Nuttall has at least 4 more high quality friendlies in which to identify the players he can utilize against CNAPs. It must be said however that Kogalo has not been impressive. lets c how they will perform against bandari & power dynamos. After that, we will be able to judge this team. We r also counting the no.of games b4 the ghanaian scores. guys tuwache moto.its practically a new team,so give them time and stop pin pointing specific new players cause that only piles pressure.Instead support them!